The IVI standard defines an open driver architecture with standardized API calls and shared software components for different common instrument classes. Together these provide critical elements needed for instrument interchangeability. Using the IVI drivers allows to interchange measurement devices of the same instrument class between different manufacturers. IVI's defined Application Programming Interfaces (APIs) standardize common measurement functions reducing the time needed to learn a new IVI instrument. Instrument simulation allows developers to run code without an instrument. This feature reduces the need for sometimes scarce measurement hardware hardware resources and it can simplify testing of measurement applications. IVI drivers feature enhanced ease of use in popular Application Development Environments. 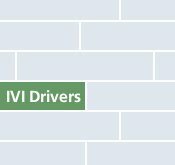 IVI's standard APIs, combined with IVI driver wrappers where appropriate, provide fast, intuitive access to driver functions.